What Kind Of Wellness Programs Should You Offer Your Workers? Ready to join the growing number of companies offering employee wellness programs, but aren’t sure where to start? Here’s a quick-start guide to what’s working in corporate wellness. “Everybody’s doing it!” is far from the best business case for any corporate initiative. But when it comes to corporate wellness programs, it’s close to the truth—and for good reasons. According to the Society for Human Resource Management, 70% of U.S. employers offer programs to help employees monitor, manage, and maximize physical health and overall well-being. Another 8% plan to start such programs this year. What drives these programs’ popularity? Well, healthy employees show up! They’re not only not taking sick days, they’re less stressed and more productive. And a healthier staff can mean lower corporate insurance costs. 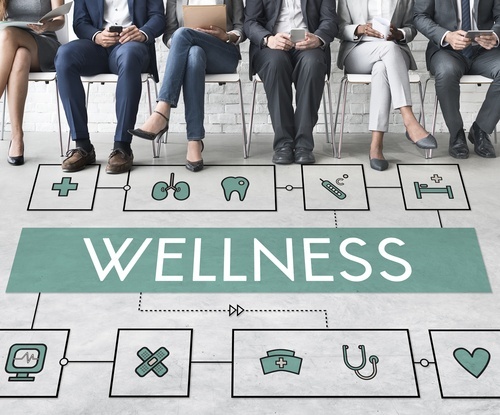 The benefits of wellness programs in the workplace are clear—but what specific types of programs should your company offer? Here’s a quick rundown of the top 5 kinds of wellness programs businesses provide employees. Each one can make significant differences to workers in and out of the workplace. Together, these programs’ potential impact make them true cornerstones of wellness..
Today’s tech-savvy workers take advantage of personal user interfaces when managing finances, shopping, and entertainment. Why shouldn’t they enjoy the same centralized, customized experience when managing their health? A personal wellness portal gives employees an easy-to-use, confidential, highly customizable space for entering and reviewing key health and wellness metrics: weight, blood pressure, BMI, and more. Through a portal, workers can access digital libraries of information about healthy living: downloadable grocery lists and recipes, reports on the latest scientific health research, video demonstrations of suggested exercises—all tailored for their individual needs. A portal can even foster fun, morale-building interaction among staff as users encourage each other to set and meet wellness goals like losing weight, quitting smoking, or exercising more. The CDC says we Americans use preventative health services only about half as much as we should, despite knowing that prevention is always preferable to treatment. Money is a barrier for some people. Others can’t squeeze a doctor’s appointment or clinic trip into already crowded schedules. But when low- or no-cost screenings happen in the workplace, employees stand a better chance of catching and treating health concerns sooner. That’s why onsite preventative screenings are part of many corporate wellness programs. Even an annual, baseline biometric screening—measuring such factors as blood pressure, cholesterol levels, and blood glucose—brought directly to workers can help motivate them to pay more attention to their health, and take action to maintain and improve it. Despite doctors’ interest in your wellness, when it comes to chronic, lifestyle-related health conditions—the conditions that most often push most of us into the doctor’s office—lecturing is about all they have time to do. Health Coaches can do more. Onsite and face-to-face, over the telephone or the internet, they take time to help people sculpt wellness strategies involving diet, exercise, and other specific behaviors. Health Coaches cheer their clients on as they make the changes they want and need. Because of this personal attention and ongoing motivation, health coaching brings measurable and long-lasting results. Employees eat healthier, manage stress more effectively, workout more regularly, stop smoking—all of which raise their quality of life, and lowers their risk of becoming a future healthcare cost for the company. Better health is serious business, but it can also be a lot of fun. Incentive management aims to engage employees in monitoring and managing their health by rewarding their participation and progress in corporate wellness programs with public recognition, small gift cards, entries in raffles for home electronics or event tickets, or discounts off health insurance premiums. Companies will often offer incentives through games and friendly, company-wide competitions. Individual and team challenges promote proper nutrition, encourage greater physical activity and exercise, and foster healthier habits all around. Does the incentive management approach work? A study by Medstat in Ann Arbor found that non-cash incentives propelled a nearly 250% increase in employee participation. Good health is its own reward—but other rewards don’t hurt, either! Standard questionnaires on which employees self-report health information still have their place. But more workplace wellness programs are making use of objective biometric information to assess their staff members’ risk for chronic and costly but easily modifiable diseases. By presenting bottom-line findings in graphical, easily understandable formats, these advanced health risk assessments offer individual employees a snapshot of where they stand. Often, facing the facts in this way provides the extra nudge they need to take charge of their health. One such assessment at Atlanta’s Emory University in 2014, for instance, motivated an employee to lose 18 pounds. “I knew I needed to put together a gameplan to get back on the right path,” she told campus press. Evidence-based assessments risk calculations identify prime candidates for specific wellness program initiatives, and contribute greatly to not only lower medical costs but also greater quality of life. Across America, companies with corporate wellness programs are discovering that investing time and resources in improving employee health pays significant dividends in less absenteeism, higher productivity, and lower health-related expenses. Is your company ready to realize these benefits? Here at Wellworks For You, we realize no one size of corporate wellness program fits all. We have expertise and experience in helping a wide range of businesses and agencies offer wellness programs in each of the 5 categories discussed here, as well as many others. If you’re ready to join the widespread corporate wellness movement, call us today, toll-free, at 1-800-425-4657, or use our online contact form. A healthier workforce and a healthier bottom line are waiting!